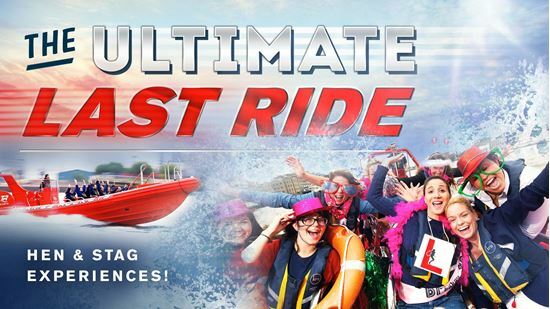 Look no further than our ever popular Stag and Hen RIB experience! Say ‘Au revoir’ to the single days with the ones who will send you off in style. Your group will set sail on the trip of a lifetime, surfing the waves at a nerve inducing 35mph! Don’t even think about cold feet as our trademark Thames Rockets medleys flow through the on board speakers that will have you and your guests grooving in your seats. It’s not the getting married that is stressful – it is arranging the send-off! Don’t worry, our bookings team will walk you down the aisle from planning through to booking, ensuring all those special extras are noted, making this the ultimate Stag or Hen party which all others will want for themselves! "Great start to a stag day!" What a fantastic experience! Although the stag party are all familiar with London and travelling down the Thames, this is a brilliant new way to see familiar sites. Special mention to the crew who were really friendly and accommodating. Will definitely be doing this again! We went on Thames Rockets for a stag do. The trip was a great success everyone enjoyed the experience! We were even able to play music favourites of the Stag that we brought on a memory stick! "Hen Party on the River!" We all absolutely loved it, even better than we thought it would be! Great fun, loved the music and guide was a great host. Have all ready recommended highly to friends and family! Thanks for helping my sister’s hen do go off with a bang! !